The Road to the Horizon: Rumble: Belgian Airforce Drops By to Say Hi. I want to wrap up at least one more short story before I leave. It is one I have been working (read: "struggling") on since a while. About a field trip to Zambia. Tentative title "Stuck in Mpulungu". Attentive readers probably saw it appearing in the scroll-box with updates in the right column as the "next short story to be released". And then saw it being replaced with "Next short story: The Dudettes". Now it is back again. Part of the story is how we got transport from a Belgian Air Force C130 Hercules cargo plane from Uganda to Zambia. 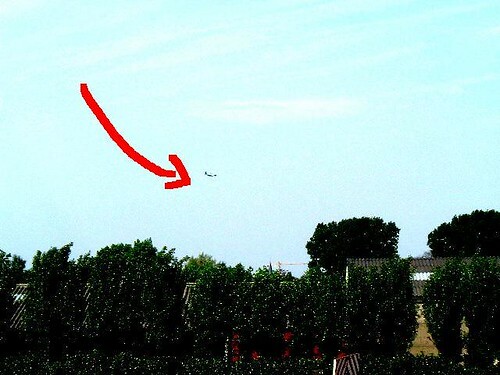 You won't believe this, but as I was sitting in the study editing the story (once more) this afternoon, a C130 from the Airforce flew over at a real low altitude and made a U-turn right above our house. I was just in time to snap the picture above as the plane flew off again. Talking about coincidences, hey? 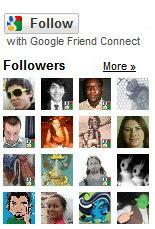 Or do you think "they" are monitoring this blog? You know! "Them"! Or was it the other "Them"? Hahaha.. Anyway, I thought it was a nice gesture, of "them". I waved to say 'Hi', and went on with my business. Yeah, yeah, spare me the jokes about the Belgian Air Force ;-) [actually I know one about the Belgian marines: they have infantry tanks with one gear forward and twenty backwards!]. YES, Belgium DOES have an air force. Seriously now: the Belgian C130 fleet is actually used a lot for humanitarian missions. One of the things they specialize in is low altitude food drops. (I hope they were not practicing for that around MY house!) Food drops are used sparingly in humanitarian relief operations, because it costs a lot. 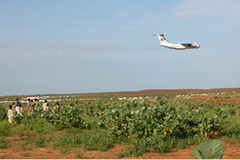 But when trying to reach places where there are no other means of transport available, humanitarian cargo is airlifted. Many of the places we airlift to also lack proper landing fields, so the plane flies over a special marked zone at low altitude (700 feet or less), opens up the cargo door, and lifts up its nose about 14 degrees. The food cargo, strapped onto roller pallets, slides out the cargo door and is dropped on the mark zone. The mark zone is guarded by an airdrop officer and a team of up to six people (often helicopter-ed in) which ensures the drop zone is free of people, and gives the plane an 'all clear' via radio before the cargo is dropped. Getting a 75 kg bag of beans on your head, dropped from 700 feet is not a nice feeling! The food is packed in normal bags. They typically triple bag 50 kg maize portions in three bags normally used for 90 kgs, so the cargo has space to 'expand' as it touches the ground. The bags are double stitched. There is seldom waste because of torn bags: less than 0.5%, which is not much more than when food is transported by truck or rail. The cost is much higher though! 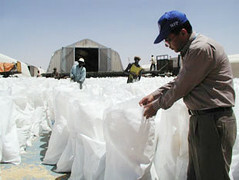 As an example: it costs US$230-US$360 to transport a ton of food from an African port to its end destination in Sudan. Airlifting or airdropping easily costs US$450 to 1,000 per ton of food. That is why airdrops are mostly done as a very last resort. Once the food hits the ground, the plane gives an all clear over the radio, and the air drop officer coordinates the pickup. All food bags are neatly stacked and transported to a warehouse, to be distributed later. There are rarely food distributions done at the drop zone, as 'crowds' and 'food drops' are a dangerous combination. To continue on the example of Sudan: to reduce the proportion of airdrops AND the cost of road transport in Sudan, WFP and its partners have heavily invested in road rehabilitation in the past two, three years (since the peace deal between Khartoum and South Sudan). 130,000 metric tons were airdropped in 2005, reduced to 40,000 metric tons airdropped in 2006. In 2007, airdrop operations have stopped all together. An additional advantage is that a road infrastructure also quickly becomes the heart of internal trade and commerce, thus stimulating the local economy. 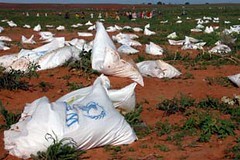 "The Logistics of Feeding 100 Million People"
Pictures food drop courtesy Richard Lee/WFP, video courtesy WFP.